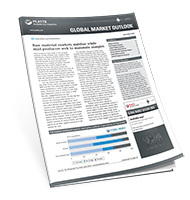 The Platts Global Market Outlook (GMO) reviews market activity around the world, and offers a forward view of steel and raw material prices, supply and demand in each region. Published monthly, it is included with the Platts Daily Briefing subscription. And of course, each issue has our key Global Market Outlook forecast! If you need to know how steel prices are likely to change in the near future, read the GMO! Sign up for a free trial of the Daily Briefing to receive the latest issue. How can I get the GMO? The Platts Global Market Outlook is included with all subscriptions to the Platts Daily Briefing. Be seen by over 25,000 steel industry executives with targeted advertising on the GMO report.